Bringing studio-grade functions to the stage, the Akai AMX is a compact but powerful 2-channel mixing surface. It is supplied with a full version of renowned digital DJ program Serato DJ, and if you already have the program, it will unlock it to produce a control surface and audio interface. The AMX can control two decks of Serato DJ with its impressive line-up of high-quality faders, knobs and buttons including the much-coveted curve-adjustable innoFADER crossfader and nifty touch-actived EQ and filter knobs. Featuring 2 sets of line/phono selectable audio inputs, it is equipped to accept signal from digital vinyl system Serato Noisemap and immediately transport it over to Serato DJ via USB connection. This makes it easier than ever to combine the versatility of a digital music library with the feel of traditional turntable and vinyl set-ups. 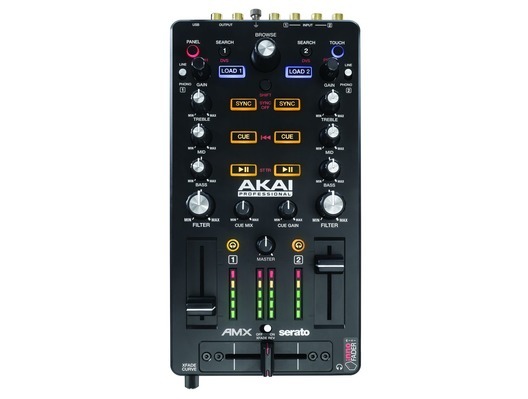 Introducing the fantastic new mixing surface for use with Serato DJ, the Akai AMX. Here we have the Akai AMX in brand new condition and in B-Stock. The B-Stock versions would have been on display at a training evening or trade exhibition only and will come boxed 'as new' with all accessories and a 1-year warranty. Put hands-on control at the center of your Serato DJ setup with AMX, a versatile 2-channel mixing surface from Akai Professional. A powerful controller for any performer, AMX controls 2 decks of Serato DJ with an intuitive array of faders, touch-activated knobs, and buttons. 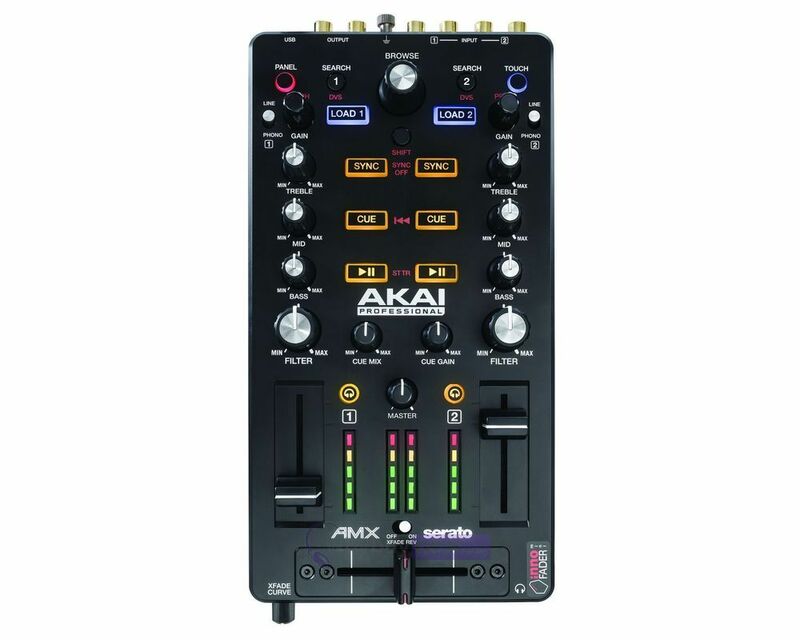 Featuring a curve-adjustable mini innoFADERTM crossfader, dedicated line faders, and control signal inputs, AMX can interface Serato DJ with turntables using Serato NoiseMapTM (DVS) or HID players over a single USB cable. Built-in headphone and master outputs integrate into any booth or tabletop setup, bringing the trusted Akai Professional hardware experience to stages and studios all over the world. Read on to see what it can bring to your next live performance using Serato DJ. Serato DJ is a robust program for digital DJ'ing. AMX comes with the full-version, letting you take advantage of precise, powerful audio manipulation in real-time. Already have Serato DJ? AMX unlocks it, providing both a control surface and audio interface to build around or have as an extra controller option. Utilizing Akai Pro's expertise in hardware innovation and sound manipulation mastery, the line between the physical and digital DJ world is extinct. AMX features the renowned innoFADER mini crossfader at the heart of its mixing surface. Coveted for its uncanny response, smooth action, and impossibly-durable build quality, the innoFADER gives DJs of all types unmatched command over transitions and cuts. 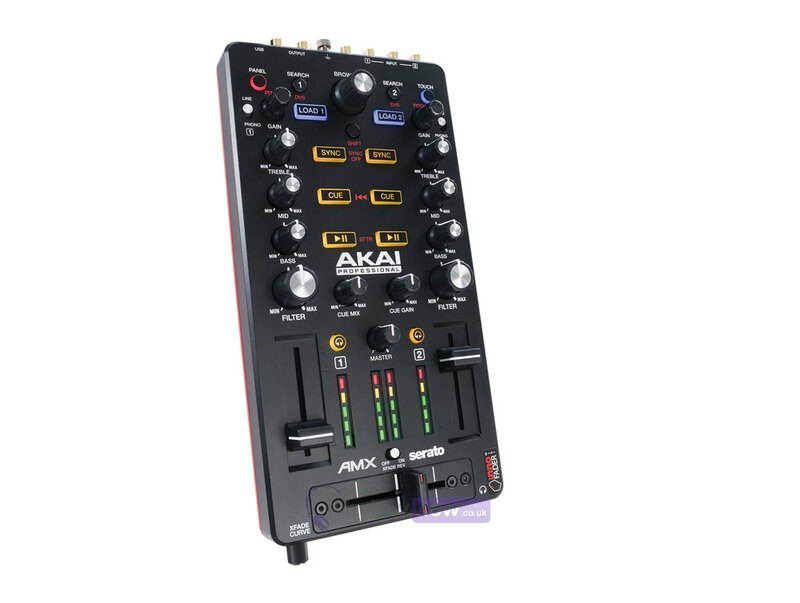 With a fully-adjustable curve response, the innoFADER mini can be calibrated for turntablists, electronic music DJ's, scratch/battle performers - AMX even includes a fader reverse switch - that can be worked hard, night in and night out. By themselves, the EQ and Filter knobs on AMX are tactile, responsive controls for shaping tracks and carving out transitions. These knobs also incorporate a dramatic "twist"- they react to the human touch. In Touch mode, each knob responds to a twist, a touch, or a combination of both. With a simple tap, you can kill an entire frequency band (or two, or three). Remove your finger and the missing bands become audible again, instantly. With Touch mode disengaged, they function as traditional mixer-style knobs for precision control over each decks' sonic composition. AMX packs professional functionality into a compact form-factor - take it everywhere. In addition to transport and mixing controls, it features a studio-grade audio interface. Get the mix from your computer to an amplification system with support for 24-bit, 96kHz audio output. As the center of your DVS setup, or as a compact travel-friendly controller, AMX brings the best of the studio to the stage in a way that only Akai Professional can.